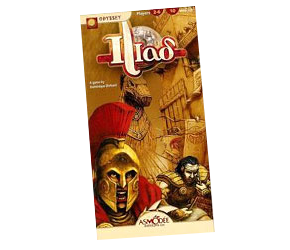 Players lead their Greek characters into a bold action of besieging Troy and rescuing the beautiful Helene. A nice little 2-6 player card game, though doesn’t play as well with 2 players. Compete to collect the largest army in a series of sieges, while attacking your opponents. Lovely graphic design by Asmodee and illustration by John Mac Cambridge. My rules summary is sized to fit in the small box.